Last update 16 Jul. 2010	Licence Free to try	| $75.00	OS Support Windows	Downloads Total: 364 | Last week: 2 Ranking #150 in Music Management Publisher The Sound Guy, Inc.
SFX Machine RT is a real-time version of the award-winning SFX Machine audio effects plug-in, now available in VST format for Windows. 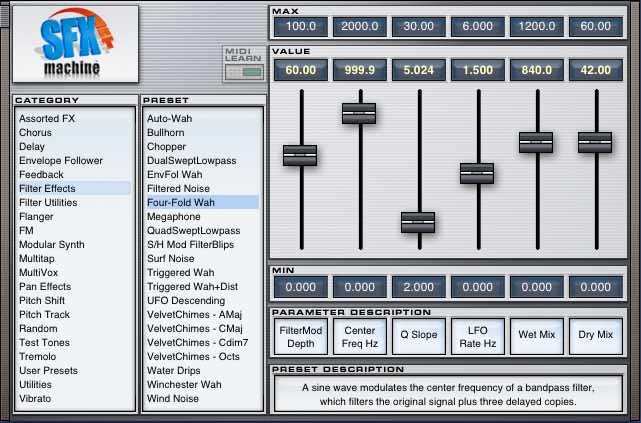 SFX Machine RT includes hundreds of presets, from conventional effects like choruses and flangers to unique, ear-catching effects. The plug-in allows automated parameter control via a simple "MIDI Learn" interface.